The project is a multidisciplinary collaboration containing installations, videos and essays about the transformation of the social, political and intimate geographies that extend from the Balkans to Turkey and the Caucasus; the creation of transit and infrastructure areas, sometimes aerial and underground, often invisible – satellites, oil pipelines, gas pipelines – that alter spaces and societies in their wake. Zona B: En los Márgenes de Europa represents a new stage of a visual and essay research project initiated in 2003 by Ursula Biemann, Angela Melitopoulos and Lisa Parks under the title Transcultural Geographies, focusing on a specific area delimited by the Balkans, Turkey and the Caucasus. 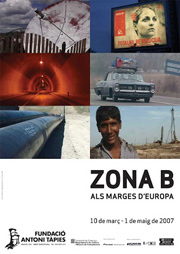 According to the authors, a Zone B within the limits of the European Union, a transit, transition and experimentation area of Zone A, the united Europe.